NBC aired this obscure genre pilot in prime time as a so-called “Special Treat” in November of 1975, even as Year One of the Gerry and Sylvia Anderson TV series Space:1999 (1975-1977) was being broadcast in syndication around the country. Today, it’s easy to tag The Day After Tomorrow (or Into Infinity, an alternate title) as an Anderson production circa the mid-1970s. The special effects by Brian Johnson are top-notch for the era, the camera-work (by veteran Frank Watts) is nothing short of stunning, and the script by the late poet Johnny Byrne captures the mystery and awe of outer space (not to mention the human experience...) in a powerful, even lyrical fashion. However, The Day After Tomorrow also serves as a rather interesting production “bridge” between Year One and Year Two of Space:1999. The hard-hitting, hard-driving musical score is from the late Derek Wadsworth, who contributed the themes for Year Two. And overall the production is a little more colorful and less minimalist in color and costume than 1999’s Year One. 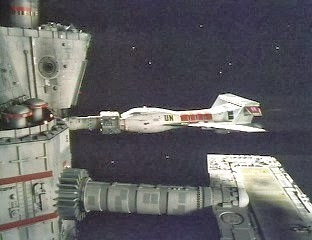 Some props, miniatures and sets also look familiar from Space:1999 Year One. 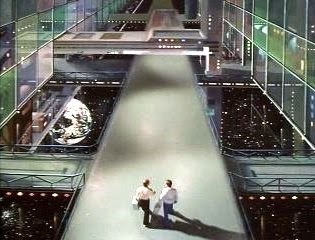 Namely the “bridge”/cockpit of the main ship, Altares, closely resembles like the bridge of the Ultra Probe from the episode entitled “Dragon’s Domain.” Other props -- the colorful computer panels, for instance -- appear to have been utilized extensively during Year Two. Even the sound effects are familiar to those who know 1999 well. So what we have in the 60-minute pilot The Day After Tomorrow is essentially an Anderson hybrid: a Year One style “awe and mystery of space” narrative, but one conveyed in the more colorful-looking/sounding Year Two fashion, if that makes sense. 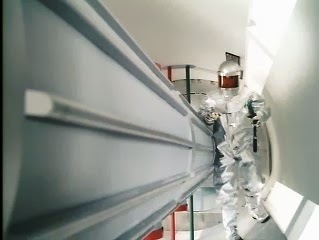 The Day After Tomorrow commences in the near future at Space Station Delta (a re-dressed Darian space ark from the 1999 episode “Mission of the Darians.”) Delta serves as a “jumping off point” for destinations beyond Earth’s solar system. 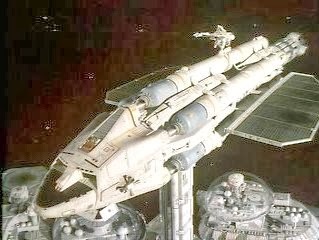 A UN shuttle docks with the station, one carrying the crew of the first “light ship,” Altares to their new berth. The Altares crew consists of Captain Harry Masters (1999’s Nick Tate), chief scientist Tom Bowen (Brian Blessed), and his wife Anna, the ship’s doctor (Joanna Dunham). Uniquely, Harry’s teenage daughter Jane (Katherine Levy) and the pre-adolescent Bowen boy, David (Martin Lev) are also full-blown crew-members on Altares. This is because of Einstein’s “time dilation” theory. Since the Altares’ main engine has harnessed the “power of the photon,” it can travel at light speed., meaning that time will pass normally for the crew, even as decades -- nay centuries -- pass for people living back on Earth. In such an environment, parents would be younger than their children on the event of a return trip. After a pre-launch countdown that includes a check for “human stress factors,” the Altares departs Space Station Delta bound for Alpha Centauri. Despite experiencing incredibly g-force stress during the voyage, the crew survives the acceleration to light speed (while noting such phenomena as meteorite showers and a Doppler shift). The crew votes to continue forward into the great beyond after reaching Alpha Centauri. 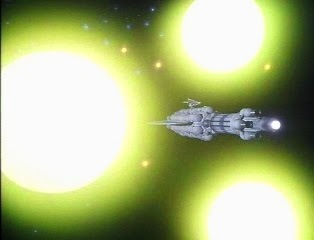 Upon re-activation, however, the photon engine breaks down, stranding the Altares in the gravitational pull of a Red Sun that is experiencing “an abnormal expansion rate.” In other words, it’s about to go supernova. I’d like to report that there’s more to the story of the Altares than that, but there isn’t. It sure would have been nice to see a regular TV series pick up where this pilot/TV-movie leaves off, with the crew exploring a new solar system. But alas, this was the last we heard of Captain Masters and his team. In terms of narrative antecedents, this straight-shooting Gerry Anderson pilot represents a sort of high-tech, science-minded update of the Lost in Space format: a ship lost in the interstellar sea, her crew…a family (or families), trying to survive and stick together. Only here there’s no Dr. Smith or Robot (not even Brian the Brain...) around making trouble. Even after nearly forty years, The Day After Tomorrow makes for a claustrophobic, action-packed hour, with almost all the action occurring inside the compact quarters of the Altares (think of a 1999 Eagle, basically). All of the incidents encountered by the crew have a solid basis in real science, per the network's demands, because the program was intended to be “educational” and for children. But, in typical Anderson (and typical Byrne...) fashion, matters tend still toward the mind-blowing, the trippy, the amazing. That would make a great tag-line for a movie remake, wouldnt it? 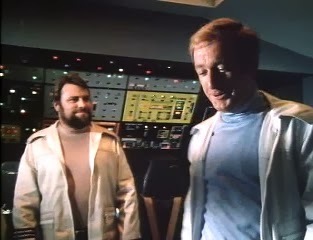 Yet despite such a trouble-prone world, the characters in The Day After Tomorrow are still very human; and – as is the case in Space:1999 -- there seems to be an underlying aura of Apollo-Age optimism about the future of man and the future of the space program. If you've been following my blog in the last few weeks, you know this period in film/TV history is a fascinating one. In series' like Space:1999 and The Day After Tomorrow it goes without question that man will create spaceships and voyage to other worlds. Of course there will be trouble and accidents along the way, but the stars are always our destination. The trained space-men of these productions don’ know what they’ll countenance in space, how to interpret it, or even how they’ll survive it, but they grit their teeth and get through it all without histrionics. “Nobody knows what it’s like to travel through a black hole…so don’t panic,” barks one astronaut in The Day After Tomorrow. 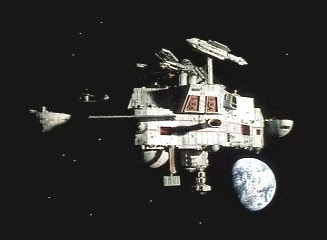 As a life-long admirer of Space:1999 (not to mention Anderson productions such as UFO and Journey to the Far Side of the Sun), I enjoyed The Day After Tomorrow for what it is: a time-capsule of once state-of-the-art science fiction. The whole production brought me right back to the mid-1970s. That was a time when interplanetary space travel seemed around the next corner. 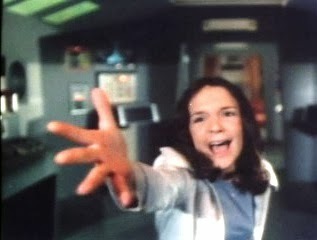 Like Space:1999, The Day After Tomorrow makes that eventuality seem exciting, a bit scary and very, very believable. John brilliant review of The Day After Tomorrow (Into Infinity) (NBC; 1975). I still remember watching this afterschool at 4p.m. when it aired. Like you John, I still appreciate having been a boy in the '70s during that wonderful time in sci-fi television. You are so right about the Gerry Anderson productions and the real NASA space program of the '70s made us believe the solar system would be conquered. John your thoughts on what Star Wars did is correct sci-fi became more fantasy and not near future possible. It's a shame this wasn't picked up for a series, as it was the most ''plausible" premise for any Anderson live-action sci-fi series. Visually, it looks like a lost episode of Space:1999. The fine sets and effects work would look great on Blu-ray, certainly more so than other sci-fi films given a blu-ray release. Just the look the finely detailed miniature work warms the hearts of fans of old-school type effects. The colorful trip through the black hole is somewhat less successful. It's hokey and dated. One sequence is still just as entertaing as any film today. The countdown to and explosion of the sun is fast-paced, dramatic, and enhanced by exciting music. I don't want to overstate my case, but I think this is a real gem of 70's science fiction television. Another excellent review, John. This 1975 special brings back a lot of memories. It had quite an impact on a certain three year old boy in 1975. Almost four decades later, it still is enjoyable viewing. Especially for a certain forty-one year old man. Hasn't this been remade into a movie called Interstellar?